In ice hockey, a forward is a player position on the ice whose primary responsibility is to score and assist goals. Generally, the forwards try to stay in three different lanes, also known as thirds, of the ice going from goal to goal. It is not mandatory, however, to stay in a lane. Staying in a lane aids in forming the common offensive strategy known as a triangle. One forward obtains the puck and then the forwards pass it between themselves making the goalie move side to side. This strategy opens up the net for scoring opportunities. This strategy allows for a constant flow of the play, attempting to maintain the control of play by one team in the offensive zone. The forwards can pass to the defence players playing at the blue line, thus freeing up the play and allowing either a shot from the point or a pass back to the offence. This then begins the triangle again. Robert Wayne Earl is an American professional ice hockey forward, currently playing for EHC Biel in the National League A (NLA). Earl was born in Chicago, Illinois, but grew up in Los Angeles, California. The New Jersey Devils are a professional ice hockey team based in Newark, New Jersey. They are members of the Metropolitan Division of the Eastern Conference of the National Hockey League (NHL). The club was founded as the Kansas City Scouts in Kansas City, Missouri, in 1974. The Scouts moved to Denver, Colorado in 1976 and became the Colorado Rockies. In 1982, they moved to East Rutherford, New Jersey and took their current name. For their first 25 seasons in New Jersey, the Devils were based at the Meadowlands Sports Complex in East Rutherford and played their home games at Brendan Byrne Arena. Before the 2007–08 season, the Devils relocated to Newark and now play their home games at Prudential Center. Dallas Franklin Eakins is a retired American-Canadian ice hockey defenceman. The Bakersfield Condors are a professional ice hockey team in the American Hockey League (AHL) based in Bakersfield, California. The team is owned by and affiliated with the National Hockey League's Edmonton Oilers. The Condors play their home games at Rabobank Arena. The AHL franchise is a relocation of the Oklahoma City Barons, which joined four other AHL franchises as the basis to form a new Pacific Division in California. Eric Fehr is a Canadian professional ice hockey centre currently playing for the Minnesota Wild of the National Hockey League (NHL). He was drafted in the first round, 18th overall, by the Washington Capitals in the 2003 NHL Entry Draft. In addition to two separate stints with Washington, Fehr has also played for the Winnipeg Jets, Pittsburgh Penguins, Toronto Maple Leafs, and the San Jose Sharks. Jonas Gustavsson is a Swedish professional ice hockey goaltender currently playing under contract to the Linköpings HC of the Swedish Hockey League (SHL). Gustavsson has previously played for the Toronto Maple Leafs, Detroit Red Wings, Boston Bruins and Edmonton Oilers in the National Hockey League (NHL). Riley Nash is a Canadian professional ice hockey forward currently playing for the Columbus Blue Jackets of the National Hockey League (NHL). He was originally selected by the Edmonton Oilers in the first round, 21st overall, of the 2007 NHL Entry Draft. 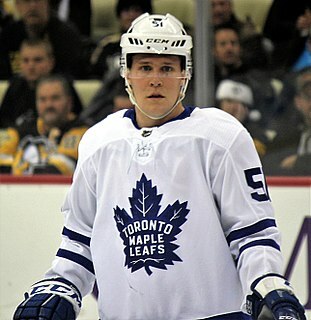 Jake William Gardiner is an American professional ice hockey defenseman who is currently playing for the Toronto Maple Leafs of the National Hockey League (NHL). He was drafted 17th overall by the Anaheim Ducks in the 2008 NHL Entry Draft. Troy Bodie is a Canadian former professional ice hockey winger. Bodie was drafted by the Edmonton Oilers in the 2003 NHL Entry Draft. He last played for the Toronto Maple Leafs of the National Hockey League (NHL), but has also spent time with the Anaheim Ducks and Carolina Hurricanes. He currently works as a professional scout for the Toronto Maple Leafs. Martin Marinčin is a Slovak professional ice hockey defenceman currently playing for the Toronto Marlies in the American Hockey League (AHL) while under contract to the Toronto Maple Leafs in the National Hockey League (NHL). He was drafted in the second round, 46th overall, by the Edmonton Oilers in the 2010 NHL Entry Draft. Colin Peter Greening is a Canadian professional ice hockey left winger currently playing for the Toronto Marlies in the American Hockey League (AHL). He previously played for the Ottawa Senators and the Toronto Maple Leafs in the National Hockey League (NHL). He was originally drafted by the Senators in the seventh round, 204th overall, in the 2005 NHL Entry Draft. Ryan Bradley Spooner is a Canadian professional ice hockey player who currently plays for the Utica Comets in the American Hockey League (AHL) while under contract to the Vancouver Canucks of the National Hockey League (NHL). He was selected by the Boston Bruins in the second round, 45th overall, of the 2010 NHL Entry Draft. Keegan Lowe is an American-born Canadian professional ice hockey defenceman. He is currently playing with the Bakersfield Condors in the American Hockey League (AHL) as a prospect for the Edmonton Oilers of the National Hockey League (NHL). Lowe was selected by the Carolina Hurricanes in the 3rd round of the 2011 NHL Entry Draft. He is the son of longtime Oilers executive and former player Kevin Lowe. Eric David Gryba is a Canadian professional ice hockey defenceman who is currently playing with the New Jersey Devils of the National Hockey League (NHL). Gryba was selected by the Ottawa Senators in the third round, 68th overall, of the 2006 NHL Entry Draft. Joey LaLeggia is a Canadian professional ice hockey defenseman who is currently playing with the San Antonio Rampage in the American Hockey League (AHL_ as a prospect within the St. Louis Blues organization of the National Hockey League. He was drafted 123rd overall in the 2012 NHL Entry Draft by the Edmonton Oilers. Karl Andreas Johnsson, last name sometimes spelled Johnson, is a Swedish professional ice hockey winger currently playing for the Toronto Maple Leafs of the National Hockey League (NHL). Johnsson was selected by the Maple Leafs in the seventh round, 202nd overall, of the 2013 NHL Entry Draft. Josh Currie is a Canadian professional ice hockey forward. He is currently playing with the Edmonton Oilers of the National Hockey League (NHL). Frédérik Gauthier is a Canadian professional ice hockey player. He is currently playing for the Toronto Maple Leafs in the National Hockey League (NHL). He was selected by the Maple Leafs in the 1st round of the 2013 NHL Entry Draft. Matthew Benning is a Canadian professional ice hockey defenseman currently playing for the Edmonton Oilers of the National Hockey League (NHL). He was selected 175th overall in the 2012 NHL Entry Draft by the Boston Bruins. Jesse Puljujärvi is a Finnish professional ice hockey player for the Edmonton Oilers in the National Hockey League (NHL). Rated as a top prospect, Puljujärvi was drafted fourth overall by the Oilers in the 2016 NHL Entry Draft. Garret Sparks is an American professional ice hockey goaltender currently playing for the Toronto Maple Leafs of the NHL. Sparks was drafted by the Maple Leafs in the 7th round, 190th overall in the 2011 draft. He is notable for being one of the only goaltenders in league history to record a shutout in his NHL debut, and the first Maple Leafs goaltender to do so. In 2018, Sparks was awarded the Harry "Hap" Holmes Memorial Award as the AHL goaltender with the lowest goals against average, which helped lead the Marlies to their first Calder Cup. Caleb Jay Jones is an American professional ice hockey defenceman currently playing for the Bakersfield Condors in the American Hockey League (AHL) as a prospect to the Edmonton Oilers of the National Hockey League (NHL). His older brother, also a defenceman, is Seth Jones, who plays for and is an alternate captain for the Columbus Blue Jackets. 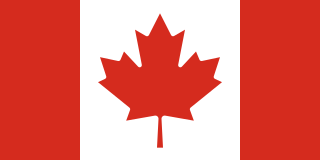 The 2017–18 Toronto Maple Leafs season was the 101st season for the National Hockey League franchise that was established on November 22, 1917. The Maple Leafs set a new franchise record in wins when they earned their 46th win of the season on March 28, 2018, and as well set a new franchise record for wins at home. The following day, the Leafs officially clinched a playoff spot for a second consecutive season. The Leafs made it to the playoffs last season, and were bumped out in the first series. Their season ended in the first round of the playoffs, losing to the Boston Bruins in seven games. Zach O'Brien is a Canadian professional ice hockey winger who plays for the Newfoundland Growlers in the ECHL while under contract to the Toronto Marlies of the American Hockey League (AHL). ↑ "Wild Signs Three Rookie Free Agents". NHL.com. Retrieved September 21, 2018. ↑ National Hockey League (2010). The National Hockey League Official Guide & Record Book/2011. Triumph Books. p. 300. ISBN 978-1-60078-422-4. ↑ Johnston, Chris (January 31, 2013). "Leafs pre-game: Hamilton ready to step up". sportsnet.ca. Retrieved September 21, 2018. ↑ "Kadri's impact immediate". Canoe.ca . 2012-03-23. Retrieved 2012-03-23. 1 2 Fox, Luke (January 31, 2013). "Maple Leafs call up AHL All-Star Game MVP". sportsnet.ca. Retrieved September 21, 2018. ↑ "Edmonton Oilers sign Ryan Hamilton on a two-year deal". Edmonton Journal . 2013-07-05. Retrieved 2013-07-07. ↑ "Oshawa's Ryan Hamilton scores first NHL goal with Edmonton Oilers". durhamregion.com. February 11, 2015. Retrieved September 21, 2018. ↑ "Hamilton re-signs for two-years". Bakersfield Condors . 2016-04-27. Retrieved 2016-04-27. ↑ "Hamilton, Cote join Sharks scouting staff". American Hockey League . 2018-07-31. Retrieved 2018-07-31.